Callaway Golf’s new Big Bertha Fusion driver features a carbon composite (called “triaxial carbon’’) in the crown and parts of the sole. This strong material, according to the company, is thinner and lighter than the forged composite in previous Callaway drivers and makes the BB Fusion the most forgiving driver Callaway has ever produced. 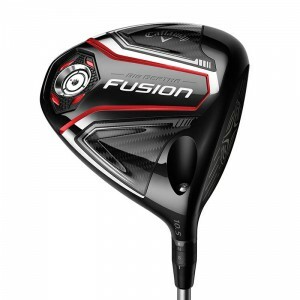 Compared to the current Great Big Bertha, Callaway says 20 percent more of the Fusion face produces ball speeds within three mph of maximum output. Perhaps most significant to average players, Callaway for the first time is offering shafts in two standard lengths – 44.5 inches and 45.5 inches. That’s good news players who can’t handle today’s longer stock shafts. The new Big Bertha Fusion, which features the company’s OptiFit adjustable loft system, will be available Sept. 30 at a suggested retail price of $399.